Mario Prada began selling leather handbags, shoes, travel trunks, and waterproof garments in 1913. In 1979 Mario’s granddaughter, Miuccia, assumed the business and expanded the company into the luxury segment. Since then, Prada’s fashion-forward approach has been devoted to technological research, innovative design, and impeccable quality. Prada eyeglasses are distinctive, not only for their high quality standards, but for their forward-thinking approach to style. 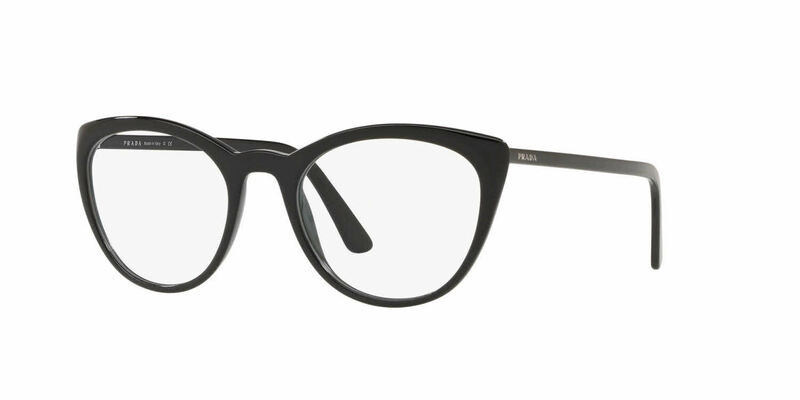 If you’re looking for a non-conventional interpretation of fashion that embraces technology while respecting tradition, then look no further than Prada’s distinctive line of eyeglass frames. Due to manufacturer's restrictions, Prada products cannot be shipped to Australia. Prada PR 07VVF is a Full Rim frame for Women, which is made of Acetate. This model features a Cat-Eye shape, with a Single Bridge. These Eyeglasses work well for people whose style is: Stylish Designer, Cool/Trendy. Prada PR 07VVF Eyeglasses come with a cleaning cloth and protective carrying case.